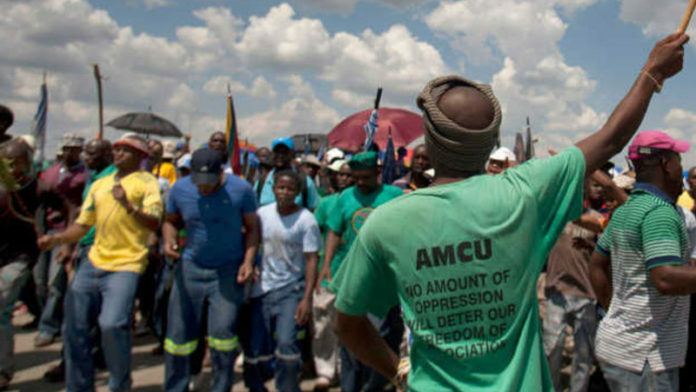 THE Association of Mineworkers & Construction Union’s (AMCU’s) efforts to broaden industrial action has failed after the Labour Court today judged a secondary strike to be unprotected, according to a statement by Lonmin. Lonmin said the Labour Court had “… passed a judgement that the secondary strike proposed by AMCU would be unprotected, preventing the union and its members from undertaking such action at the company’s operations”. Lonmin added that its shafts continued to run “as normal”. AMCU called the secondary strike in support of union members out on strike since November at the Driefontein and Beatrix gold mines owned by Sibanye-Stillwater. The intention was to put further pressure on the company by disrupting production at Sibanye-Stillwater’s Rustenburg platinum group metal operations. The union had earlier withdrawn secondary strike notices at a number of other companies including DRDGold and African Rainbow Minerals citing legal difficulties. Today’s court judgement raises questions about the sustainability of its gold strike, primarily over a wage deal AMCU declined to accept in November. The gold strike has been punctuated with regular incidences of violence and damage to property and loss of life. An inter-ministerial group has been holding meetings with AMCU and the National Union of Mineworkers (NUM) over violent protests in the Carletonville area, west of Johannesburg, where Driefontein is located. Neal Froneman, CEO of Sibanye-Stillwater, said in February the company has the ability to withstand a prolonged AMCU strike. However, it has sought to bring the union to agreement offering a package to striking employees earlier this month including bridging loans and salary advances so they could absorb the effects of the strike action. In her ruling, in which she deliberated for more than two weeks after reserving judgement on February 28, Judge Connie Prinsloo said AMCU’s proposed secondary strike would have “a major effect” on the South African economy, far outweighing the “negligible” benefits it would have in compelling Sibanye-Stillwater to accede to AMCU’s gold wage demands. It was therefore “unreasonable”.